Additional speed cameras on South Dakota Avenue NE. Red light cameras at the intersection of Michigan Avenue and South Dakota. Traffic calming along Taylor St. between 10th and 12th Streets NE. Changing signal timing along South Dakota to reduce/eliminate number of continuous green lights that encourage vehicular speeding. Securing speed bumps on residential side streets. Working with DDOT & MPD to address traffic problems generated during AM drop-off & PM pick-up by cars and school buses at the Brookland Education Campus at Bunker Hill School along 14th St. NE. Periodic clean-ups of triangle parks, and celebrating our work with pot luck picnics. Working with DPR to address maintenance and continued improvements to the Turkey Thicket Recreation Center. Mayor Gray has announced that Turkey Thicket will receive additional funds for improvements in 2013. Working with DDOT’s Urban Forestry Administration (UFA) to identify locations for 40+ trees to be planted in Spring 2013. Working with DDOT and the Ward 5 Councilmember’s office to install new curbing and sidewalks at various locations, including the 4300 block of 18th St. NE and 1600 block of Michigan Avenue NE. 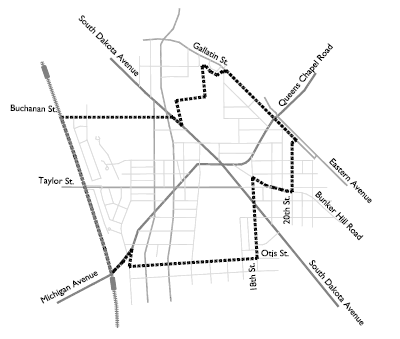 Working with DDOT and Ward 5 Councilmember McDuffie to secure funding for implementation of improvements identified in the 2007 South Dakota Avenue Transportation & Urban Design Study. Identifying other infrastructure projects throughout Michigan Park on an as-needed basis. Supporting annual clean-ups through such entities as DC-Cares. Inviting Ward 5 School Board Member, Mark Jones, to our monthly meetings to apprise MPCA members on school issues and to respond to neighborhood concerns. Working with the new Principal of the Brookland School at Bunker Hill to support school initiatives. Sponsoring holidays gifts for a Bunker Hill School student at Christmas. Participating in the Ward 5 Council on Education to guide pending school closures as they affect Michigan Park (and Ward 5 generally). Inform MPCA of ongoing citywide initiatives as they affect Michigan Park. Listen to concerns from MPCA members. Respond to requests for service and assistance to resolve problems affecting residents. Support Michigan Park in citywide decisions affecting Ward 5, with Ward 5 Councilmember Kenyan McDuffie; At-Large Councilmember Vincent Orange (a resident of Michigan Park and MPCA member); newly-elected At-Large Councilmember David Grosso (a resident of Brookland); and newly-elected ANC Commissioners. Serving on a citizens committee for the 2007-08 South Dakota Avenue. Transportation & Urban Design Study. Obtaining a speed camera for South Dakota Avenue at Taylor St. NE. Re-striping multiple pedestrian crosswalks along South Dakota Avenue and in other locations throughout Michigan Park. Securing new sidewalks along South Dakota and Michigan Avenues as well as Bunker Hill Road NE. Planted 83 trees through four community planting projects with Casey Trees in three triangle parks and public right-of-way over the past two years. This includes: Shepherd/Michigan Park (10 trees); Michigan/Bunker Hill Road Park (37 trees); 1600 block Michigan right-of-way (21 trees); 4200 block South Dakota right-of-way (14 trees). Obtained 50+ trees planted throughout the neighborhood through DDOT’s Urban Forestry Administration (UFA). Served on a citizens committee to support $220,000 in improvements to the triangle park located at Michigan/Bunker Hill Road/18th St. NE, funded through the Dept. of Parks & Recreation (DPR). Designated a DPR ‘Friends of the Park’ for the triangle park located at Michigan/Shepherd/12th St NE. Obtained 501c(3) sponsorship by The Community Foundation as a means to secure funding grants dedicated to maintenance and planting of three triangle parks in Michigan Park. Historic preservation designation of Bunker Hill School, with approval of Historic Landmark Application #11-20 by the DC Historic Preservation Review Board (HPRB) and State Historic Preservation Office (SHPO). This designation marked the end of four years of research and efforts by MPCA members and neighbors to preserve the exterior of the original 1939 school building and façade. The effort commenced after the February 2008 announcement by DCPS to close the school. Led by Hayden Wetzel and MPCA member David Conrad, and with the support of Ward 5 School Board member, Mark Jones as well as ANC 5A-08 Commissioner, Timothy Thomas. Working with the new Principal of the Bunker Hill School to support school initiatives as identified. Sponsoring Citizen’s Scholarship bonds for Bunker Hill School students.